Lake Garda is Italy's largest and most visited lake. The lake is 51km long but only 17km wide at its widest point in the south. The distance around the lake is 158km. Picturesque villages, medieval castles, and lakeside promenades dot the shoreline. The lake has a diverse landscape with beaches along the southern shores and rocky cliffs above the northern shoreline. Lake Garda is known for its clear water, great for swimming in summer. Windsurfing, sailing, and hiking in the lake's many parks are popular activities. Lake Garda is in northern Italy between Venice and Milan. The lake is part of the Lombardy region on the west and the Veneto on the east. The northern tip is in the Trentino-Alto Adige region. The Dolomite mountains are not far away and can be seen towering above the lake. Here are top rated hotels for Riva del Garda in the north and Desenzano del Garda and Peschiera del Garda in the south. Find more Lake Garda hotels with guest ratings and reviews, pictures, and descriptions on Venere. There are train stations in Desenzano and Peschiera del Garda in the south. In the north, the closest station to the lake is in Rovereto, east of Riva del Garda. The closest airports are in Verona and Brescia. The closest large airport is Milan Malpensa. See Italy Airports Map. The A4 autostrada between Milan and Venice runs south of the lake. Along the east is the A22, Brennero to Modena autostrada. Lake Garda is well served by hydrofoils, catamarans, and ferries, especially during summer. Car ferries between the western and eastern shores run between Toscolano Maderno and Torri del Benaco and between Limone and Malcesine. Public buses run all around the lake. 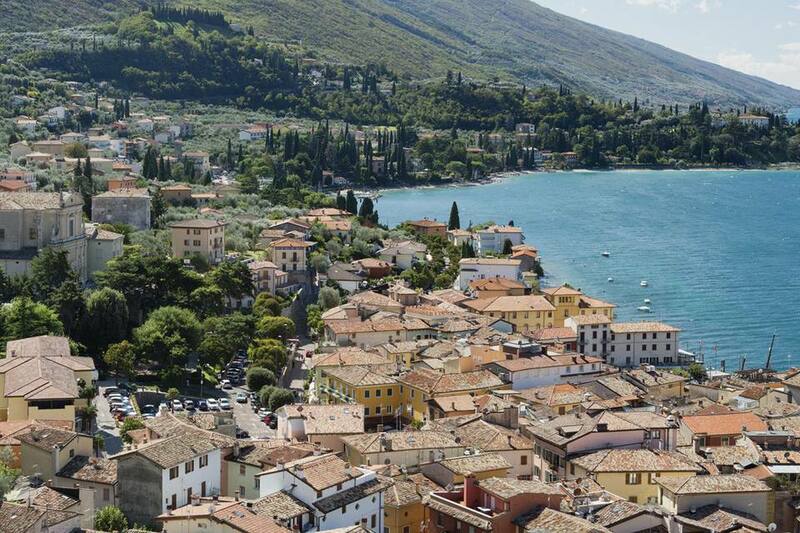 If you are driving, take a look at this Lake Garda and Veneto Road Trip Planner from Auto Europe. See our Lake Garda Map for the location of towns. Riva del Garda is a popular summer resort and one of the best places for windsurfing. The town is dominated by a fortress. Malcesine has a historic center with tiny streets, a small harbor, and a medieval castle. From Malcesine, the cable car goes to Monte Baldo, known as the Garden of Europe, where there are botanical gardens, hiking paths, and spectacular views. Bardolino has thermal baths and a wellness and beauty center at the Hotel Caesius Thermæ & Spa Resort. Gardaland is the largest amusement park in Italy. It's in Castelnuovo del Garda near Pescheria. There's a free shuttle bus from the Pescheria train station. The Gardaland bus runs from many of the towns around Lake Garda. Sirmione, a town favored by artists and poets, has a medieval center dominated by a large medieval castle. The town is known for its thermal bath resorts. Le Grotte di Catullo, on the Sirmione peninsula, has ruins of the family villa of Catulla, a writer or senator of the Roman empire. The site is situated in a spectacular point on the peninsula, surrounded by olive and lemon trees. Salo' is an elegant town of pastel houses established by Mussolini in 1943. It has a good cathedral. Gardone is known for its beautiful park with exotic plants. Its historic center dates from the middle ages and has both medieval and baroque buildings. There are several aristocratic villas from the early 20th century. There are tourist information offices in the towns of Garda, Malcesine, Riva del Garda, Desenzano, Sirmione, Peschiera, and Gardone.